Ray Caldwell, born this day in 1988, threw a no-hitter for the Cleveland Indians in 1919. Today is one of two days throughout the calendar year in which we’re most flush with no-no birthdays. 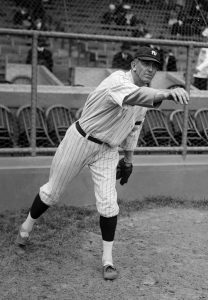 Five pitchers of no-hitters celebrate April 26 as the day of their entrances into the world: Ray Caldwell (born in 1888), Jesse Barnes (born in 1892), Virgil Trucks (pictured above, born in 1917), Sal Maglie (born in 1917) and Mike Scott (born in 1955, turns 61 today). The other day with five no-no throwers born is June 1.